London, UK. Land of Big Ben, Minding the Gap, Oasis, and… Barbecue? In what may appear an oddity in a country stereotyped for bland food, Jamie Oliver and Adam Perry Lang came together last year to open the contemporary, “Barbecoa London“. Consisting of a high-end butchery on the first floor, and a sit down restaurant on the second floor, Barbecoa is an experience. Serving beef hung on-site for 5 to 11 weeks in their dry aging room, Barbecoa is a foodie and locally grown delight with only British and irish meat supplied by their butcher’s shop. We brought a small group of 10 friends and co-workers to Barbecoa and were first struck by the butchery after a short cab ride. All steel and glass, the location appears brand new and brandished in etched glass and massive meat lockers with floor to ceiling glass you can peer into. We arrived at dinner time as the butchery staff were closing up, a small sandwich board highlighting special Winter warmers such as Beef Short Ribs, Ox Cheeks, and Beef for Stew Bourguignon & Stroganoff. Then there’s the smell. The combination of smoke and searing meat wafting around the block, wrapping in a subtle but enticing attack on the senses, like a street barker coaxing you into a local eatery through your sense of smell. We headed upstairs and the smell became stronger. Dimly lit, the restaurant wraps around a central kitchen from which three grills peer out through glass and an active kitchen. A well appointed bar meets you on one end, while the hostess stand on the mall entrance end opens into space for larger groups. The decor is decidedly contemporary, with smoked glass and steel anchoring the building, inventive touches of rough hewn and stained wood hang from the ceiling, reminiscent of spanish or moroccan stylings. On to the menu. A mix of contemporary and traditional offerings, our group started with the Bread Board, Pork Scratchings w/ Chipotle Sauce, Calamari, Crispy Pig Cheeks, and Pit-Smoked Baby Back Ribs. The Bread board was your typical fare of thick cut artisan bread and home-made butter and the Pork Scratchings required a bit of explaining to we Americans. Scratchings are pig skin, flash fried. We found the the Chipotle sauce to be good and mild, but the Scratchings were tough and tasteless, the only item that wasn’t finished by the group. Everything else from the starting plates was excellent- the Calamari was crips, the pig cheeks presenting a moist and collagen-rich taste like a high end pulled pork. 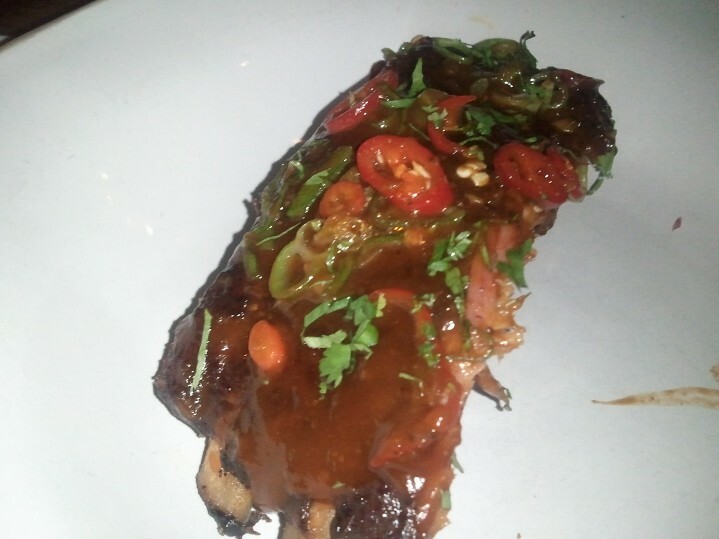 The Ribs were a stand out for two reasons- Flavor and Texture. Colorfully presented, they imparted a strong smoky taste that relaxed to reveal a medley of spices. My only complaint is that they were a little dry, and the membrane wasn’t removed from the bottom of the ribs. This was a bit of a disappointment at a high end eatery but also a point of personal decision as many chefs prefer to keep the membrane on, it created more work for our crowd. The barbecue sauce had a good tang to it without being overpowering. For main courses, we were invited to choose from separate menu items from the high heat Charcoal & Wood Grill, Wood Oven or Texas Pit Smoker. Portions of our group had the Filet Mignon Steak, others the Lamb Chops. But the overall hit of the evening was the Pulled Pork Shoulder served with Waffle, BBQ Sauce, and Coleslaw. The Waffle was a fun bit, the sauce mixed into the pulled pork which was moist and held the smoke very well. The cole slaw was crunchy, creamy and slightly sweet. Side dishes and desert were also hits. The Mashed Potatoes and Creamed Spinach had members of our table going back for seconds. The dessert menu has been updated vs. what’s available on the website and our group was pleased with the offerings, though I didn’t enjoy personally. From our partner group of ten, I received multiple compliments on the selection of Barbecoa, even among those who aren’t regular BBQ enthusiasts and frankly, prefer their food on the bland side. The only complaint of the group was the odd choice of ambient music, almost a retro rave, dubstep soundtrack that tries a little to hard to show that barbecue isn’t just for paper plates and placemats. In summary, Barbecoa is hands-down a must visit when in London. Located not far from St. Paul’s Cathedral in Central London, there are plenty of shops nearby to make it worth an afternoon visit. If you live in the area, be sure to visit the Butchery for locally grown meats and specials. We hope this duo brings the Barbecoa concept to more locations soon. For more on Barbecoa, please check out the following interview with the Chefs and tour of the experience. Bacon Frosting - Archie McPhee & Co.